The last couple of weeks have confirmed more than ever how obsessed America is with celebrity. Even when events of much greater consequence to our daily lives occur, more newsprint, more air time and more Internet bandwidth are given to celebrities in the news. Why do we grant equivalent if not greater importance as a society to people who entertain us rather than people who produce for society in other ways, such as manufacturing and teaching? There may be numerous answers to this question. One is that entertainment is a vital human pursuit that makes us, well, human. We need to be entertained to nourish our souls, and the people who entertain us play important roles. Furthermore, the songs singers sing to us; the stories actors perform for us; the games that athletes play for us become part of our individual stories. Their successes and failures become metaphors for our own. Let’s consider some recent headlines to illustrate this point. Last week marked the 50th anniversary of the Beatles first trip to America and their appearance on the Ed Sullivan Show. It’s amazing how these four men, their music and the moment they stepped onto the American stage all continue to capture our imagination. Their music was transformative in that it feels current, even decades later. The recent passing of Shirley Temple Black reminded us of the young girl who brought song and smiles to our nation in the midst of the Depression. She then grew up and became a distinguished diplomat and public servant, blazing a trail for women in public service. Sid Caesar, who died this week, revolutionized American comedy, bringing Borscht Belt humor to the masses via television. Pete Seeger, the granddaddy of American Folk music, used joyful song to galvanize multiple social movements including for civil rights, labor and the environment. These were not just three people who grew old and died. They touched people’s souls in personal ways and were transformative figures through their genres of entertainment. Other entertainers in the news remind us of the fragility of life, its complexity and occasional tragedies. Phillip Seymour Hoffman’s death by a drug overdose reminded us of the dangers of substance abuse and that some of the most accomplished and celebrated actors are not immune from this disease. New public allegations that Dylan Farrow was molested as a child by Woody Allen forces the issue of child sexual molestation back into the limelight. We are forced to confront not just whether or not we think Woody Allen is a creep but whether our society has turned a corner in confronting the seriousness of the broader issue of child sexual abuse. Any of the celebrities I mentioned and their respective achievements and failures would probably warrant a sermon in his or her own right. I’ve chosen to briefly survey these recent newsmakers to highlight the extent to which people who entertain us grab our attention. We live vicariously through performers such as these because, as human beings, they help provide structure and purpose to our lives. In this light, perhaps it should not come as a surprise that among the numerous roles that Moses plays in leading the Israelites, he is also a great performer on the public stage. We see his flair for the dramatic on full display in this week’s Torah portion, Parashat Ki-Tissa. The reading contains the famous–or infamous–story of the Golden Calf. The Israelites fear that Moses is not returning from the mountaintop, and they make a graven image–a golden calf–in direct violation of the second of the Ten Commandments that they had just received. God is incensed and threatens to destroy the people. Moses, not having yet seen the idolatry has enough distance to put God “on the couch” as it were, and talk him out of destroying the people. However, once Moses sees the idolatry himself, his rage is so great he throws down and breaks the tablets of the Decalogue. The above is the plain sense of the text. The Midrash and commentators probe a little deeper to try to get inside the head of Moses to see what he was really thinking and why he would take such an extreme measure. 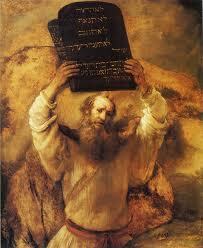 Moses may have been the great lawgiver, but his job description also included Actor-In-Chief. It’s possible that both the Midrash and Abravanel are correct and that Moses was playing to different audiences at the same time–God AND the people. In this case he gave the performance of his life. Moses shows that a leader is tasked with engaging the soul as well as the mind. He intuitively understood that the people needed a performance. They needed drama. In fact, his absence for forty days prompted their yearning for the ritual performance of the Golden Calf. His clamping down on that act of idolatry had to be even more dramatic in order to get his point across. “It has been written that ‘[a]ll the world is a stage, and all the men and women merely the players’ (Shakespeare). For Jews everywhere, that is more than a literary catch phrase. It’s a philosophy for living, for surviving. For, do we not daily reenact our traditions? Do we not daily reenact our faith? And do we not daily rededicate ourselves to continuity of a vast, varied and colorful heritage, the Jewish heritage? “It has also been written that ‘[t]here is that smaller world which is the stage, and that larger stage which is the world’” (Isaac Goldberg, early 20th century journalist). My grandfather’s words continue to ring true. So, the next time we read an obituary about an entertainer or a story about a fall from grace of a celebrity, let’s remind ourselves that it’s only human for us to consume such stories because we need performers in our society. But let us also remember that Moses himself was also a performer who mustered his dramatic skills to inspire a nation towards repentance and renewal.